When I first came to America I thought there were probably a few books I could read that would catch me up on American Culture 101. I started with Leaves of Grass but found it pompous and self-important. Then I wandered around novels set in Five Points in the late 1800s, because sooner or later PT Barnum made an appearance and he seemed more American than Walt Whitman. Then I discovered Tall Tales, the folklore of America and I was deeply satisfied. Here was a whole genre of simple stories that proved my theory that all Americans are con-artists and tricksters who want to steal your time and take your money. Needless to say, ten years later I've tempered that opinion somewhat. The more Americans I meet and the more states I visit I get a wider understanding of the American character and the diverse nature of the population. Now I would say that only most Americans are con-artists and tricksters who want to steal your time and take your money. Which brings me (eventually) to The Adventures of Tom Sawyer a book about an idealized childhood that feels more like a series of Tall Tales plucked from the clean Missouri air. When Tom sells his classmates the privilege of whitewashing Aunt Polly’s fence, it reads like a morality tale, a fable or at least a story you’ve heard before. The Adventures of Tom Sawyer is the story of a boy and his friends spending the summer getting into trouble and tricking the unwary. But there's also a darker story here. Tom witnesses a brutal murder, fears for his life, identifies a murderer at a trial, gets lost in a natural cave system with the killer for three days and finally sees him brought to natural justice by being sealed into the cave to starve to death. I read this book as a child and I didn't remember that it was a psychological thriller. I just remembered the funny bits. And yes, it is funny. There were countless times I smiled while reading and when Twain breaks the fourth wall in order to draw a curtain over the consequences of Tom's failure to know any scripture I actually laughed out loud. Twain builds up the tension and then pops that balloon with a careless style. It's also a dashing adventure story, a sappy romance and a morality tale. Only in a Mark Twain book would a vagrant child turn down a fortune in gold because he doesn't want to wear shoes. Why is it on the list? Other than the moral of the tale being that the wily and immoral will always prosper. There's also plenty here that venerates childhood and idealizes nature. 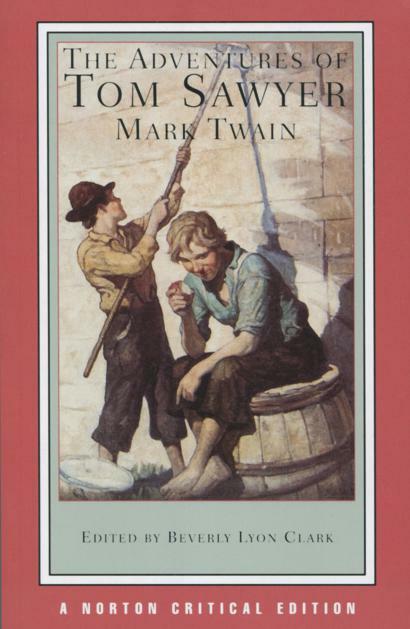 Tom Sawyer is a soft focus version of the pick-pocket urchins of Charles Dickens. More beautifully atmospheric and less premeditated. Another thing that stood out for me is the theme of superstition, some which Tom invents and some which he actually believes. He or his friends are scared of ghosts, witches, ha'nted houses, howling stray dogs and starting an enterprise on a Friday. There's a whole chapter about how a dead cat can cure warts if you say the right words over it. Of course, Twain's point here is not to venerate superstition, but to hold it up to ridicule, but he certainly has plenty of material to work with. I was reminded of the difference between Halloween in America, where it is a huge and excitable candy sprinkled festival of fear and Britain, where it is a gloomy night. Mark Twain is a legend himself. A giant mustachioed epigram generator. A satirist for all time. A true American iconoclast. It's a wonder to me that this pillar of satire hasn't crumbled. After all, the book continues to be banned or challenged for it's racist language. And the presentation of Native Americans as desperate barbaric murderers is pretty uncomfortable reading. Perhaps there really is an American tendency to venerate the confidence trick. After all, there's a con-artist in the White House right now and he isn't the first.